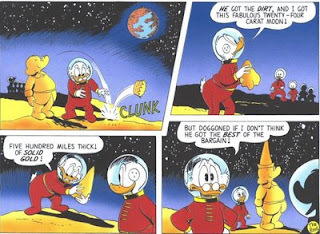 Duck Comics Revue: "The Twenty-Four Carat Moon"
I was going to include two space-gold-rush stories in this post, but it got kind of long, so I'm cutting it in half. "The Loony Lunar Gold Rush" is coming soon. Please look forward to it! Obviously, Scrooge NEEDS to have it. 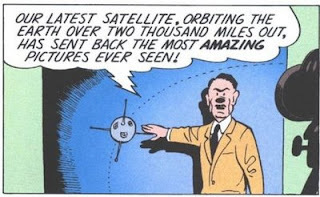 So do lots of other people, and the space race is on! This represents the biggest treasure that Scrooge has ever gone for. It may be less resonant than his more historically-grounded treasure hunts, but it's still pretty neat. However, one has to wonder a little bit about the economics of this. According to the internet, all of the gold in the world would be contained in an eighty-two foot cube. Whereas this moon is five hundred miles in diameter. 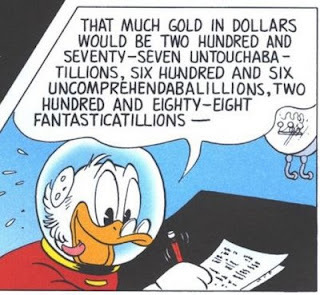 My meagre mathematical abilities are insufficient to compare cubes to spheres, but it's pretty obvious that this makes all of Scrooge's other treasure hunts look like penny-ante stuff. But JUST A DERN MOMENT. As I've said before, I don't know much about economics, but I know enough to know that suddenly increasing the world's gold supply by many orders of magnitude will decrease its value rather precipitously. In spite of what gold-standard-agitators seem to think, gold does not have intrinsic value, and if the supply has become effectively unlimited...well, forget about it. 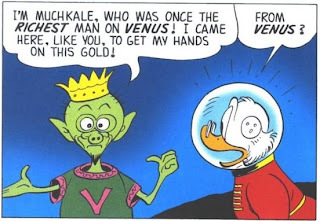 Barks has shown elsewhere (see 1951's "Financial Fable") that he is not oblivious to economic issues, but here? I dunno. I don't even think that artificially limiting the supply, like De Beers does with diamonds, is gonna work too well, since it's obvious to everyone that it's up there. But then, Scrooge is probably smarter than me, so maybe he'll figure something out. Because REALLY, dude, even if they're not actually made of gold, statues of steers exquisitely sculpted out of meteors are nothing to sneeze at. And given the aforementioned economic issues, the Cattle King might actually be getting a better deal this way. 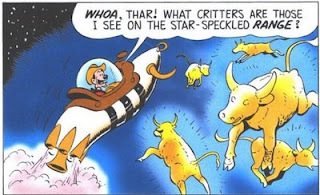 Incidentally, although he's never referred to by name here, the Cattle King appears in at least one other Barks story (though not, oddly enough, in the story called "The Cattle King"), and he's named Longhorn Tallgrass. The more you know! Hi, Muchkale! But how do you speak our language? That's what I call SCIENCE, baby! The colorist of the version (the original one, actually) that I read when I was small helpfully made the dunce cap a different color. That really confused me. 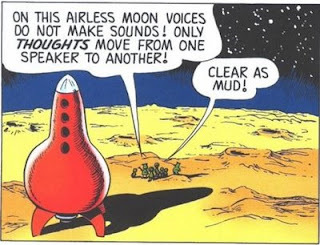 Even if the increased gold supply doesn't render this moon monetarily valueless (certainly I should think it would still be of scientific worth), it's inevitable that--in spite of this inconceivable value--Scrooge would go back to wanting more; seeing Muchkale's machine in action just speeds up the process. It's what fuels his character, sure, but don't get so damn cocky: it's what fuels ALL of us to some extent. It's what Buddhists want to get away from, and it's a point that David Foster Wallace makes in "A Supposedly Fun Thing I'll Never Do Again:" if you're given what is supposed to be perfect material comfort in every way, all that will happen is that you'll end up getting acclimated to it and start wanting MORE, even if it seems incredibly petty. This doesn't mean that real-life plutocrats don't deserve our contempt, but it IS human nature. I don't suppose Barks was actually trying to make this point, but it's a good one nonetheless. 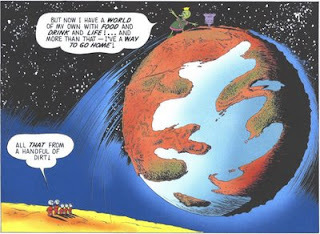 These here duck comics are some deep stuff! "Ancient Persia" and "King Scrooge the First"